This is a verson of an article published in Volume 20 of the Castle Studies Group Journal, 2007 as 'English Licences to Crenellate 1199-1567' - Some changes have been made to better suit hyperlinked text and reflecting new information since the original publication. The illustrations used here are completely different from those in the published article. A further article, with more analyis was published in 2009 and is available online. The data in this article was last updated on 22 November 2009. The image of the original licence to crenellate to Kingston upon Hull was added 12 March 2010. The serious study of castles is riddled with past assumptions, prejudice and 'theories' that have gained popular credence and move into the work of established 'fact'. Castles were erected, from the start, to be powerful symbolic1 buildings and through the past and in to the modern world various contemporary symbolic values has been attached to the 'fortifications' of castles and their like. The study of licences to crenellate is a particularly good example of this. Victorian concerns with empire and strong centralised government lead to Victorian scholars describing licences to crenellate as a requirement imposed by central authority to control over mighty lords, a view still widely stated. It should be made clear that there is no evidence, whatsoever, for this view. Much of what has been written about licences to crenellate was based on a few examples, often atypical, and on misreading and misattribution of other historical documents. Very few scholars have done in depth study of the subject (the most notable is Charles Coulson2). In particular it is important to understand that the so called 'adulterine' castles of the Anarchy of Stephen were not 'unlicenced', as sometimes stated; they were 'tainted' because they had been built and used in a rebellion. A licence to crenellate was supposedly a grant that gave permission for a building to be fortified. This may have started in the Carolingian Empire as a way to control castle building to prevent local lords from becoming over mighty or too strong but, in feudal society, the licence was used both by king and baron as a symbol of their status. With "few exceptions at times of turbulence, the king's right as overlord to license was a right to grant, not to refuse, permission to crenellate" (Coulson, 1982, p71) and "In reality, no feudal or sub-feudal ruler could either in law or in practice deny to his vassal the protection by self-help fortifying which he, as lord, had failed to provide." (Coulson, 1982, p97n10) It was not in reality necessary to obtain a licence to crenellate to erect a fortified building. There was "very slight chance of interference by royal officials even in so intensively governed a realm as England, but a licence was prestigious and could be had for the asking." (Coulson, 1982, p70).3 Fortifications were not restricted by law, the cost of building and, particularly, of providing a garrison restricted true military castles to a very limited number anyway. In England licences to crenellate were granted by the Monarch; the Bishop of Durham, in his position as ruler of the Palatinate of Durham; the Earl of Chester, in his position as ruler of the Palatinate of Cheshire and after the formation of the Palatinate of Lancashire in 1351, the Duke of Lancaster. Few documented records survive from before the 13th century. One of the earliest supposed licence to crenellate for which some form of reliable documentation exists is one in 1141 to Geoffrey de Mandeville, Earl of Essex, made by King Stephen. This grant was repeated by Empress Matilda and named as his new castle on the Lea (novum castellum super Lviam), usually considered to be South Mymms. This is a retrospective 'grant' in complex charters obtained by Geoffrey at a time during the Anarchy, when he was able to dictate terms, and when he was imposing his noble status and it is not now considered a licence to crenellate in a meaningful sense. Of the later surviving grants it is clear that these were not an attempt to control the major lords but were mainly granted to relatively minor knights for quite small manor houses, many of which could only have had token fortifications (However, a good number of the clerks, yeomen, squires and knights granted licences were servants of the crown, with direct access to the king and other licences are granted at the request of people with direct access to the king). Licences to crenellate were mainly symbolic representations of lordly status; "castellation was the architectural expression of noble rank" (Coulson, 1982, p72) and also "to publicly prominent ecclesiastics and lay magnates in England a licence had the extra cachet of royal recognition, acknowledgement and compliment. Unlike other royal patronage it conferred no fiscal advantage whatever, but it was as eagerly sought by the socially ambitious as any lucrative privilege." (Coulson, 1982, p83). The building that often, but not always, resulted from these licences, which had some show of fortification, like battlements, moats and gatehouses, were also mainly symbolic, although the fortifications probably represented some defence against thieves. Coulson goes to some length to express the idea that the much 'fortification' in ecclesiastic and lay buildings was symbolic, both for the occupants and the 'mob' they were a defence against. The gatehouse was the most powerful symbol and the strongest part of the defence, yet mobs often attacked the gatehouse, rather than simple push over a surrounding, relatively weak, precinct wall. However, the gatehouse was rarely manned enough to resist an attack anyway. In effect many 'defences' were like modern burglar alarms and CCTV; some are sham and even when they are not they represent more an expression of legal ownership and intent to prosecute rather than a real preventative measure. Strong doors, good locks and fear of being caught stops thieves, alarms may help somewhat with this last psychological barrier but, of themselves, alarms do not stop thieves. It has been claimed that 'only about forty licences resulted in the construction of true castles' (my italic) (Hull, 2005, p128). This, to my mind, shows a failure to appreciate what licences to crenellate were and, indeed, what castles were. Bodiam and Wardour are cited as true castle but neither of these is military. The same source writes only 13 percent of licences were ever fully acted upon. I find this figure incredulous. The evidence to obtain such a figure just does not exist, many sites are poorly known and exist only as the moat of long demolished house and have not been excavated so no date can be given for the building work. This seems to be a fundamental error of presuming absence of evidence to be evidence of absence. I am of the opinion that most licences did, in fact, result in significant building work of crenellated domestic houses, which was exactly what was intended to be built and what was licenced. The licence was not permission to build a military fortress; a person with the power and resources to do so would not require permission. The licence was a grant which allowed someone to show their social rank through a symbolic building. Hull also writes "As time progressed, kings became more reluctant to grant licences to crenellate. "(ibid) There is absolutely no evidence for this. In reality it is more probably that the desire to apply for a licence diminished and that what the up and coming noble wanted was not a castellated house but a deer park, something which may well have actually required some degree of royal consent. 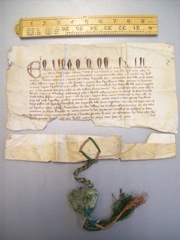 The original patent letter of Edward III to the burgesses of Kingston-upon-Hull confirming the licence by the late king for the strengthening their town with moats and a wall and to crenellate the wall; with further licence for them to crenellate their houses with stone or tegula (tile/brick). By kind permission of the Hull History Centre. No fee was normally charged for licence, the handful of fees recorded are relatively small (half a mark or a mark) and are clearly to cover the bureaucratic cost of searching the records or writing the licence and not to raise money. It has been said an annual fee was required; this is due to a misinterpretation of a single reference (see Estharptree 1343). A number of licences specifically state that no fee is to taken and there is no evidence to suggest licences to crenellate were issued to raise royal revenue. Most licences were issued as patent letters granted under the privy seal. To fully understand licences to crenellate a widespread study is required. To this end a comprehensive list of licences to crenellate, linkable to details of all the individual sites licensed, has been compiled by me and is available as a download or online. The information in this list was originally derived from the list published by Turner and Parker,4 although I have also added references to licences to crenellate from the other sources used in compiling this web site and the list is considerably more substantial than that of Parker. I have checked the references given by other sources to the various published transcription/translation of the original medieval documents, most notably, but not exclusively, the Calendars of Patent and Charter Rolls, and checked all the indexes but I have not done a page by page search through the very numerous volumes. I have also checked against the Handlist of Licences to Crenellate made by Charles Coulson - who did do a page by page search of the Calendars. This has given much more detail to the licences, particularly full dates, and did bring to light some licences not in other sources. It also resolved some difficulties in Parker's list (notably Crodonio, which Parker tentatively attributed to Croydon, which turns out to be Creon in Aquitaine when the full details of the licence are seen.). The PRO translations are not without fault, the "calendarists unwittingly intruded their own concept of state supremacy and defence-monopoly" (Coulson, 1995, p145). I have neither the latin nor the resources to check the original manuscript parchment rolls which, anyway, require protection. Maxstoke Castle granted a licence to crenellate in 1345. 433 were Royal (including 12 Pardons and retrospective grants). 19 of these were confirmations of previous licences of which 3 are included in this analysis because they may include licence for new work. A further 4 licences were revoked (plus the licence to Thomas de Gourney, not in the rolls, was probably revoked because of his death during the licensing process; see Estharptree 1343. 8 were Palatinate of Durham (including 3 Pardons and retrospective grants). 5 were Palatinate of Cheshire. 2 were Duchy of Lancaster. 450 were for named private residences (31 sites are issued further licences for possible new work - called 'repeat' below) a further 6 (or more) unnamed sites are licenced, such as the licence of 1311 to Hugo le Despenser, the elder, for ‘all his dwelling houses’. 28 were for urban defences (7 repeats). 44 were for ecclesiastical5 sites (7 repeats). 47 of the licences were for multiple site. 18 town defences (of 284 in my list - 6%) plus the four in Wales and Guernsey. NB. There is some duplication of these descriptions, i.e. buildings which have been described both as castles and fortified manor houses (e.g. Eccleshall Castle). However, this does not significantly distort these figures. Whilst there may be some 'lost' licences8 it is inconceivable that 60% for fortified manor houses are lost and the argument that licences to crenellate were a 'requirement' for fortifications does not stand up to examination. Clearly most fortified buildings were built without the owner applying for a licence to crenellate. Of the 114 fortifications in Northumberland enlisted, possibly for Henry V, in 1415 just 23 had licences although most were buildings built after 1300King. So even among building considered strong enough to defend against an attack from the Scottish army the majority were unlicenced and the king knew this. 1 Keeper of Bolton hospital. Townsmen, in various terms (burgesses, commonalty, good men), are mention in 24 licences. The mayor is also mentioned in six of these. 11 Yeomen (10 individuals), most of these are significant persons with direct access to the king such as Edward III treasurer John Molyns. the others, not ranked in the licences are probably mainly knights. Licences for Dodyngton (1403), Wodhall (1410), Rykmersworth (1426), Wycroft (1427) and Rye (1443) are granted to groups of named men. Some of these may have been trustees, acting on behalf of another; that for Wycroft, was actually for Thomas Brooke supported by his allies after he had been attacked. These number refer to the number of licences, not the number of properties. 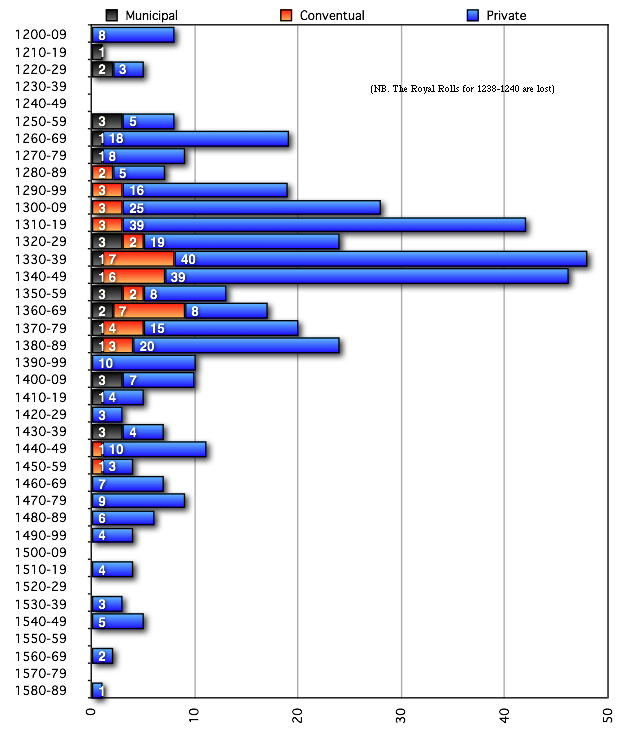 Again these number refer to the number of licences, not the number of properties. Clicking on the dates on the chart will open the relevant part of the list in a new window. Conventual licences (to abbeys, cathedral chapters etc) are particularly concentrated from 1280 -1380, there is no evidence of a drop in these licences from the Black Death, indeed there may be a slight increase in the couple of decades after 1348. Clearly the troubles throughout the 14th century may have affected a desire from such communities to cut themselves off from the secular world, or at least symbolically defend themselves from it. However, I would speculate that an increase in income, resulting from increased beneficiaries after the plague, allowed a funding of buildings. 53 licences are combined with licence to impark land. These are mostly 15th and 16th century licences and nearly all later private licences to crenellate are part of more complex grants, including park enclosure. Some licences to crenellate are clearly for hunting lodges, such as that for Lewis Johan 1414 . Increasingly the country house with park, rather than the castle, became the symbol of lordship and lordship came to be displayed through its privileges rather than its duties. The expression 'on the sea coast' (juxta mare) is used in 7 licences; Flaynburgh 1351, Quarrera 1365, Chidiok 1370, Bodyham 1385, Herewiche 1405, Malberthorpe 1459 and Letley 1547. The expression in or by the marches of Scotland (marchia Scocia) is used in 9 licences; Dromburgh 1307, Dunmalloght 1307, Scaleby 1307 (Three separate licences granted on the same day), Blemansoppe 1340, Treuermane 1340 (Two separate licences granted on the same day - The granting of separate licences on the same day is unusual), Harcla 1353, Wirkyngton 1380, Penreth 1397 and 1399. 33 licences use the term castle (castrum), seven are for pre-existing castles the other are to make manors into castles. 12 licences use the term fortalice (fortalicium) - three using both terms. Licences were granted at Westminster (207), Berwick-on Tweed (9), Canterbury (4), Lincoln (4), Northampton (6), Nottingham (6), Roxburgh (5), Tower of London (5), Windsor (11), Worcester (4), Woodstock (14), York (22) and 72 other places (3 or less licences). There seems, to me, to be little relation between the place of the grant and the location of building licensed. Fore instance of the 4 licences granted at Roxburgh in 1335, three were for buildings in Cornwall and one for a building in York. The location of the 25 buildings of the 22 York licences are; Yorkshire (9), Shropshire (3), Norfolk (2), Kent (2), Cumberland, Sussex, Devon, Lincolnshire, Bedfordshire, Oxfordshire, Durham, Gloucestershire and Wiltshire. As the practice of the Chancery became gradually systematised, a custom was developed of entering on Letters Patent, and on the enrolment of them, a note of the authority under which the Great Seal had been affixed to them. For these later licences the relevant numbers are; 224 by Privy Seal (Per breve de private sigillo), 103 by King (Per ipsum Regem)+ 1 by Queen, 4 by King and Council (Per ipsum Regem et Concilium), 7 by Council (Per Concilium) and 2 by Petition in Parliament (14 of the previous also by authority of parliament). burgesses of Harwich, 1405 - 20 shillings. Thomas Hungerford, 1383, a pardon - 1 mark. Selby Abbey, 1375 - half a mark. William Thorp, 1374 - 1 mark. Joan, widow of William de Sancto Quintmo, 1374- half a mark. John de Sutton, 1352, a pardon - 20 shillings. 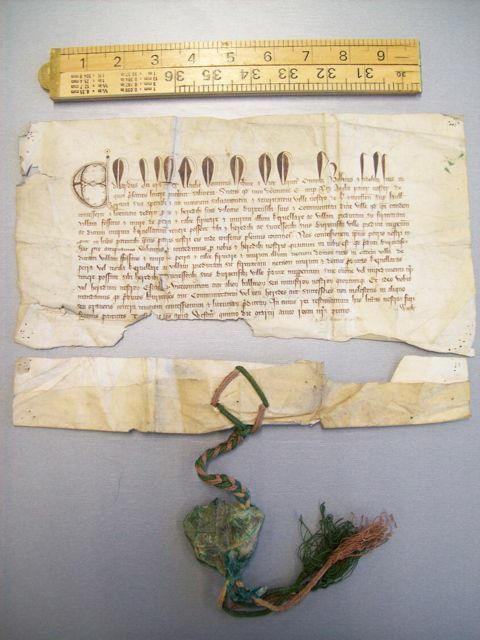 Bishop, canons and citizens of Salisbury, 1328, an additional licence to an inspeximus - 20 shillings, almost certainly for the inspeximus and not the new grant. Inspeximus always incurred a fee but these are not part of this analysis unless additional licence was granted (they are detailed in the list of licences). The only conclusion I feel comfortable drawing from this is that the clerk of 1374/5 was either particularly conscientious in recording a standing fee or in getting a fee. There is, of course, no such thing as a typical licence. However, one might talk about a 'mode' licence, that of the most common form. This would be a licence granted by Edward III at Westminster by privy seal to a knight for a single property (mansum - dwelling place), described by modern writers as a fortified manor house, such as that granted in 1345 to Roger Hillary to crenellate his dwelling-place of Berkmondescote, co. Stafford. The distribution map shows little other than the tendency for municipal licences granted to build town walls to be mainly a feature of coastal towns. Distribution is fairly random and there is certainly no evidence of a concentration of licenced 'fortifications' in the Scottish March or the coast. Calendar of Patent Rolls preserved in the Public Record Office (1232- 1509), 52 vols. (London, 1891- 1916) [A scanned copy of most but not all volumes, poorly indexed, is available online from the University of Iowa. This is useful if you have a proper page reference.]. Various reports of the Deputy Keeper and the other similar sources are detailed in the individual entries. King, D.J.C., 1983, Castellarium Anglicanum (Kraus) 2 Vols. 1 A symbolic building is not the same as a sham building. A flag or banner has a useful function on a battlefield as a rallying point but its symbolic value far exceeds this functional role; consider the value given to the Eagles of Roman legions. A more medieval example of the same sort would be the heraldic coat of arms. This useful identifier on the battlefield or at the tournament is loaded with literally symbolic meaning. The portcullis, to this day remains, the symbol of the Houses of Parliament. 2 Charles Coulson is a challenging author. He writes primarily for academics about subjects which require some understanding of medieval latin and fairly profound concepts like ‘symbolism’. He uses numerous footnotes to provide supporting evidence which can be difficult to read. However, it is just this wealth of supporting evidence and deep understanding which does make him the most credible author on the subject. Charles, quite rightly, informs me that “History is not journalism” and I hope those that make the small struggle with what may appear to be a difficult style will be as richly rewarding as I have been by his ideas. 4 The list was J.H. Parker's compilation, based on the early work of Public Record Office officials (mainly Thomas Duffus Hardy) that lead to the latter Calendars. He completed the books begun by Turner and added, as an appendix, his list, which he had previously had published in the Gentlemen's Magazine for 1856. 4b Earlier versions of this paper recorded a town house (Pilkington Hall) in Wakefield, this was actually a manor house, in grounds, in the exceptional large parish of Wakefield. 5 Abbeys, Cathedral Closes, Churches but not bishop’s palaces, rector’s tower etc. which are private residences. 6 ‘Dertemuth’, probably Gommerock, - John Corp 1402, ‘le Camber’ - Richard Guldeford 1487, Tynemouth in 1536 where a group of citizens had permission to build and fortify 2 lighthouses and William Paulett 1547 Letley. The licence to the abbot of Quarr in 1365 seems also have been intended to produce coastal artillery forts at Fishhouse and elsewhere on the Isle of Wight. 7 Whilst every licenced house is recorded in my list as fortified my list only records unlicenced house as fortified if some author has described it as such. A good number of moated houses are not recorded in my list but would be very similar in form to some of the licenced houses. Therefore, 39% is an over estimate, possible a large over estimate of the proportion of licenced to unlicenced moated house. In fact I estimate less than 10% and possibly less than 5% of such houses were granted a licence to crenellate. 8 The mandate to make letters to Robert Clifford 'that he may crenellate his castles of Brouham and Pendragon, C. Westmoreland. ', survives as a damaged roll, calendared in the Chancery Warrents - but the actual licence is not enrolled. Hartlebury Castle has a strong tradition of being licenced but this is also not enrolled and there are a few other such 'ghost' licences, some of which are probably inventions. After 1200 there are a few gaps in the royal rolls, notable 23 and 24 Henry III (1238-40), but records are substantial complete and it is unlikely that many licences were missed from the rolls. The situation with palatinate licences is less clear and potential a greater proportion of these licences may be lost although it is probable that there were never a substantial number of these licences. 9 Matilda, widow of William Ferrars; Matilda [Maud] widow of Sir John Marmion; Joan, late the wife of William de Sancto Quintmo and Matilda de Well. Joan, widow of Gwilym ap Gruffudd may have been granted a licence for Penrhyn castle Wales, but this possible licence is not part of the general analysis. Alice de Leygrave, the king’s wet nurse, has been attributed with a grant but this seems to actually be for Adam le Bret, at her request. Burga de Valibius (Vaux), widow of Sir William de Valibius requested the licence granted to St Benets Abbey. King Since this article was original written Dr Andy King has written 'Fortress and fashion statements: gentry castles in fourteenth-century Northumberland' which provides considerable evidence which supports Coulson's view of licences to crenellate, particularly with regard to Northumbrian castles in the 1415 list.